Tell me, O muse, of that ingenious hero who travelled far and wide after he had sacked the famous town of Troy…. What is it with that Homeric ‘O’? It’s all at once the hallowed ‘O’ summoning a god, the plaintive ‘O’ asking to receive the story, and the demanding ‘O’ calling for a passerby to listen, to listen now because there is something vital that must be said. The first is filled with hubris, as if we’re even worthy to make the call. The last, more akin to faith, underscores the belief that the story can and will be told to it’s full fruition. I feel it most, though, as the aching cry, the lament – the Oh Christ, or the child curled in the fetal position, moaning to himself, oh…oh…oh, feeling the score of the wound behind, or the weight of the task ahead, yet unable to get the words out. But we are not children. And we do have allies. When resolve is lacking, we have cohorts ready to bind us to the mast so that we may stare ahead resolutely, deaf to the call of sirens. Time to get with it. Where do we go this morning as that once great Greece stumbles along in shambles? 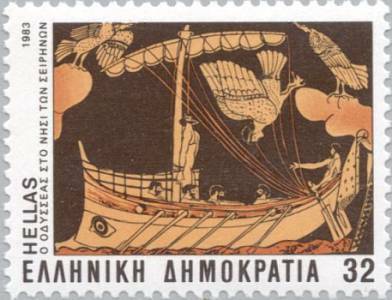 This entry was posted in The Boat and tagged Greece, Homer, odysseus, sirens, stories, summoning the muse, writing by Andrew Lewis. Bookmark the permalink.